"Sean Price the leader of Boot Camp Click now..." - Sean P.
If anyone would've told me in '95 that Ruck aka Sean Price from Heltah Skeltah would be the "leader" of the Boot Camp Click I would've probably thought you either didn't know anything about hip hop, you never heard any of the other cats rhyme in the BCC or you were just on crack. But that's exactly what Sean P has become. I remember the first time by dude Lunchboxx put me onto Sean P. He got in my ear like you heard Sean P's new album "Monkey Barz?" And I'm like "Sean Price? The dude Ruck from Heltah Skeltah? Naw...I ain't heard that." And he was like "trust me, this album is crazy!" And because this is my dude I trusted him and I'm damn sure glad I did. "Monkey Barz" was BANANAS and had me going back to "Nocturnal" to pay more attention to Ruck's verses. (I can't front, I always paid more attention to Rock as I'm sure most of ya'll did too) I instantly joined the Sean Price street team telling any and everybody who would listen about money. Any dude who comes out calling themselves "the brokest rapper alive" at a time in hip hop when 90% of rappers are flossing and making it rain is my kinda dude. I can't front his follow up "Jesus Price Supastar" didn't have the same umph to me as "Monkey Barz." Maybe it was because I didn't have any expectations for "Monkey Barz" and going into "Jesus Price" I was expecting a damn near classic from Sean P and even though it didn't pan out like that I still know how nasty Sean P is. So with "Mic Tyson" on tap I'm all ears and this go round but at the same time I'm not expecting "Illmatic" either. The Alchemist produced bangers "The Genesis of the Omega"and "Bar-Barian" sets "Mic Tyson" off lovely and "Pyrex" sounds like producer Amp was trying to do his best Primo imitation but the jawn actually sounds better then what Preem's been dropping lately and has P going in, "whole lotta shots followed, after I bust your snot box with a ciroc bottle, shoot the fair one mono a mono, the clown, I pull the pound on a Ronald McDonald, you a happy mean n-gga with a toy in the box, I clap the steel n-gga put your boy in a box." "Price In Shining Armor" featuring Ruste Juxx is dope, "Title Track" got an ill electro boom bap to it and has Price telling us, "I'm the best in the borough, I'm the best in the city, I'm the best in the state, and the rest of you think, don't question the ape, throw the sketch at your face, bang bang shoot em up make a mess of the place, oh you an E head, oh you a weed head, I got a big gun bigger then Maxi Priest dreads, f-ck the rhyme though, I'm back on my grind mode, me and my connect, we keep is kosher like Shyne Po", "S.T.F.U. Part 2" got an ill KRS sample explaining how to stop violence and as usual, P's back at in again, "All I do is rap and rhyme, I don't know today's math, don't keep track of time, universal beatdown, beatdown your universe, Sean P aka you the worse, the best rapper, the worst rapper, the sketh clapper, the purse snatcher, the neck snapper, the earth slapper, this your man Sean, the opposite of a f-cking Duran Duran song." "Hush" has P. going in over an ill Krysis produced banger, "I be watching these n-ggaz watching the throne, watch me take their wristwatch now watch me go home, I be working with the gage, animalistic rapper men of a certain age, the slugs from the 8 spin through you, I ain't trying to talk dog, I ain't Ace Ventura." The Stu Bangas "Frankenberry" featuring Buckshot is dope and P doesn't disappoint with more ill quotes as always, "punch you in the face now you able to taste BBQ" which leads into Evidence & Babu's produced "BBQ Sauce" featuring P's label mate the great Pharoahe Monch on the chorus while the Beat Bucha's produced "Battering Bars" featuring Pumpkinhead and "The Hardest N-gga Out" end the album on a hard note with P asking the question, "look at that, where you get those pants from, look at that, where you get that dance from, I don't dance for n-ggaz, I take trips, flips sh-t, in advance on n-ggaz"but my favorite banger on "Mic Tyson" is the Alchemist produced (why don't these 2 just do an album together?) "Bully Rap" featuring Reality Rap where P just blacks out, "you cowards are bogus, split head like red sea, power of Moses, due to my weight gain I had to double the dosage, of drugs that I do or n-ggaz they toasted" and ends the verse with "use your baby's organs, to make a baby organ, I sell dope to your momma and I ain't vote for Obama." 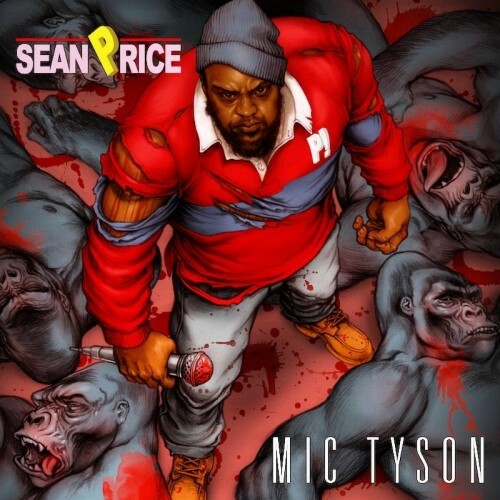 If you mess with Sean Prince, then you'll mess with "Mic Tyson." Cause when it comes down to it, you either rock with him or you don't. There's really no middle ground with P, it's like Pharoahe said "this is not rocket science." And me being a fan and purist for that boom bap genre of hip hop that's damn near extinct nowadays (I'm not with the rest of ya'll cats claiming hip hop is alive and well just cause there's a million MC's out here) I mos def rock with P. This dude is one of the last of a dying breed of MC's from the 90's that still gets down for his with no problem. So even though we all made the wrong call back in '95 about who was the nicest in the BCC, with "Mic Tyson" Sean P's "makes for damn certain we don't make that same mistake again.